*If you don't have an Azure subscription, create a free account before you begin. For the purpose of this tutorial, we are using a single database. You could also use a pooled database in an elastic pool or an instance database in a managed instance. 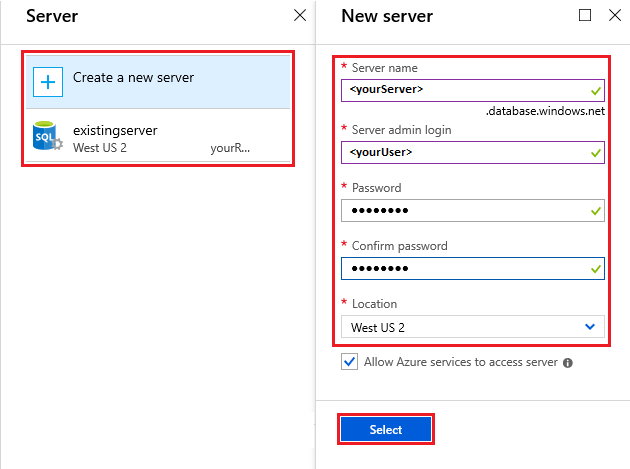 For connectivity to a managed instance, see these managed instance quickstarts: Quickstart: Configure Azure VM to connect to an Azure SQL Database Managed Instance and Quickstart: Configure a point-to-site connection to an Azure SQL Database Managed Instance from on-premises. A single database in Azure SQL Database is created with a defined set of compute and storage resources. The database is created within an Azure resource group and is managed using an database server. Follow these steps to create a blank single database. 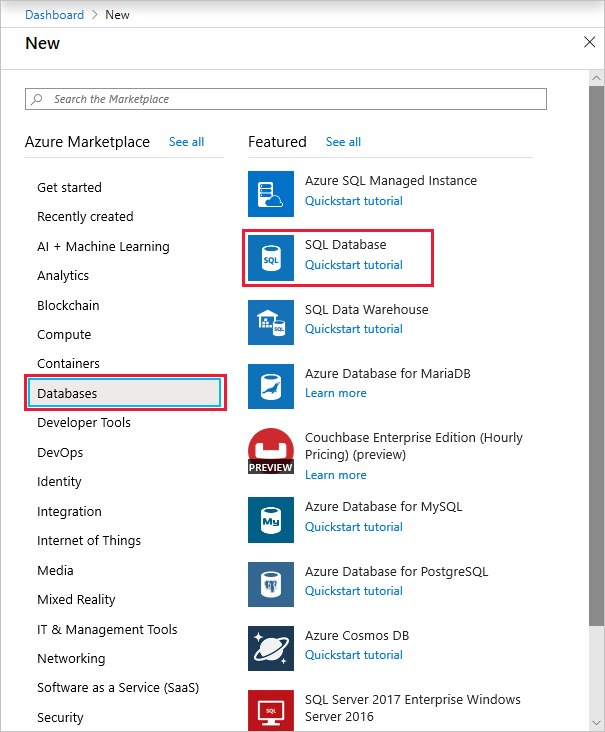 On the New page, select Databases in the Azure Marketplace section, and then click SQL Database in the Featured section. Database name yourDatabase For valid database names, see Database identifiers. Subscription yourSubscription For details about your subscriptions, see Subscriptions. Resource group yourResourceGroup For valid resource group names, see Naming rules and restrictions. Select source Blank database Specifies that a blank database should be created. Server name Any globally unique name For valid server names, see Naming rules and restrictions. Server admin login Any valid name For valid login names, see Database identifiers. Password Any valid password Your password must have at least eight characters and must use characters from three of the following categories: upper case characters, lower case characters, numbers, and non-alphanumeric characters. Location Any valid location For information about regions, see Azure Regions. Click Pricing tier to specify the service tier, the number of DTUs or vCores, and the amount of storage. You may explore the options for the number of DTUs/vCores and storage that is available to you for each service tier. After selecting the service tier, the number of DTUs or vCores, and the amount of storage, click Apply. Now that you've completed the SQL Database form, click Create to provision the single database. This step may take a few minutes. On the toolbar, click Notifications to monitor the deployment process. The SQL Database service creates an IP firewall at the server-level. This firewall prevents external applications and tools from connecting to the server and any databases on the server unless a firewall rule allows their IP through the firewall. To enable external connectivity to your single database, you must first add an IP firewall rule for your IP address (or IP address range). Follow these steps to create a SQL Database server-level IP firewall rule. The SQL Database service communicates over port 1433. If you are trying to connect to this service from within a corporate network, outbound traffic over port 1433 may not be allowed by your network's firewall. If so, you cannot connect to your single database unless your administrator opens port 1433. After the deployment completes, click SQL databases from the left-hand menu and then click yourDatabase on the SQL databases page. 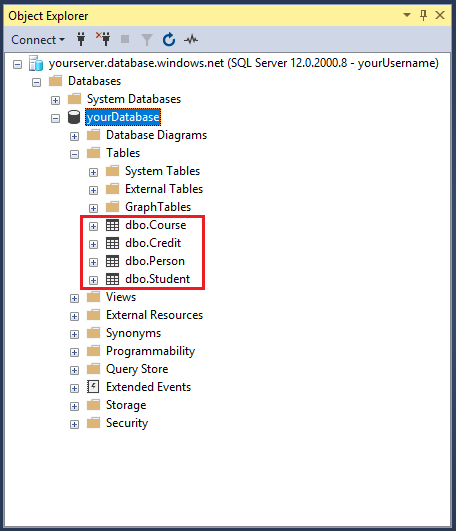 The overview page for your database opens, showing you the fully qualified Server name (such as yourserver.database.windows.net) and provides options for further configuration. 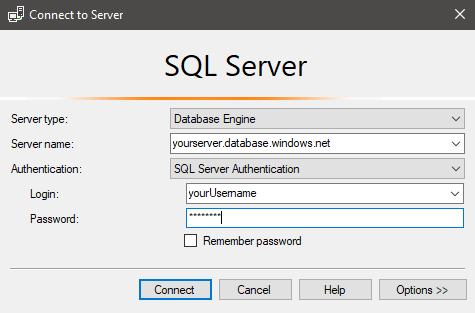 Copy this fully qualified server name for use to connect to your server and databases from SQL Server Management Studio. Click Set server firewall on the toolbar. The Firewall settings page for the SQL Database server opens. Click Add client IP on the toolbar to add your current IP address to a new IP firewall rule. An IP firewall rule can open port 1433 for a single IP address or a range of IP addresses. Click Save. A server-level IP firewall rule is created for your current IP address opening port 1433 on the SQL Database server. Click OK and then close the Firewall settings page. Your IP address can now pass through the IP firewall. 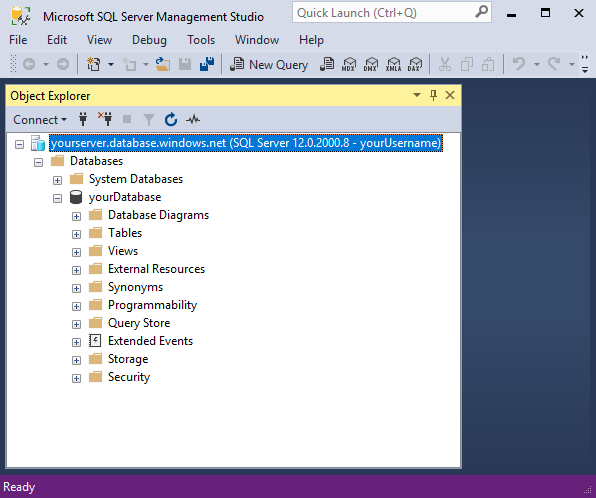 You can now connect to your single database using SQL Server Management Studio or another tool of your choice. Be sure to use the server admin account you created previously. By default, access through the SQL Database IP firewall is enabled for all Azure services. Click OFF on this page to disable for all Azure services. 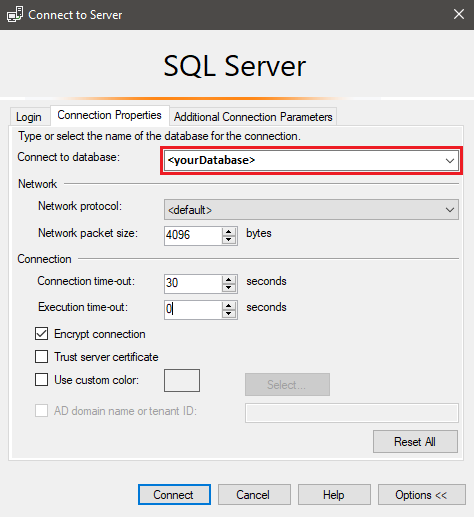 Use SQL Server Management Studio to establish a connection to your single database. Server name The fully qualified server name For example, yourserver.database.windows.net. Authentication SQL Server Authentication SQL Authentication is the only authentication type that we've configured in this tutorial. Login The server admin account The account that you specified when you created the server. Password The password for your server admin account The password that you specified when you created the server. Click Options in the Connect to server dialog box. In the Connect to database section, enter yourDatabase to connect to this database. Click Connect. The Object Explorer window opens in SSMS. In Object Explorer, expand Databases and then expand yourDatabase to view the objects in the sample database. The following diagram shows how these tables are related to each other. Some of these tables reference columns in other tables. For example, the Student table references the PersonId column of the Person table. Study the diagram to understand how the tables in this tutorial are related to one another. For an in-depth look at how to create effective database tables, see Create effective database tables. For information about choosing data types, see Data types. You can also use the table designer in SQL Server Management Studio to create and design your tables. In Object Explorer, right-click yourDatabase and select New Query. 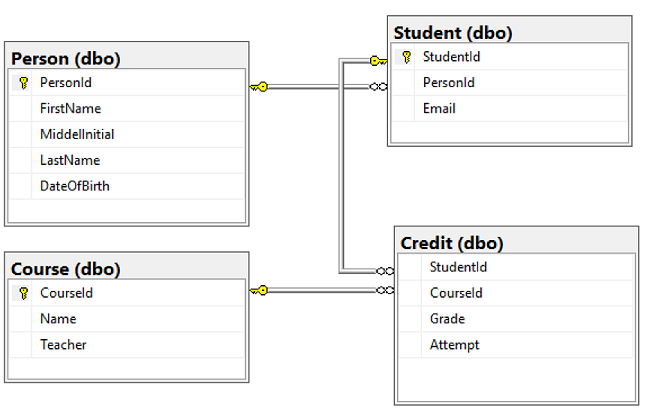 A blank query window opens that is connected to your database. Expand the Tables node under yourDatabase in the Object Explorer to see the tables you created. Create a folder called sampleData in your Downloads folder to store sample data for your database. Right-click the following links and save them into the sampleData folder. Open a command prompt window and navigate to the sampleData folder. Execute the following commands to insert sample data into the tables replacing the values for server, database, user, and password with the values for your environment. bcp Course in SampleCourseData -S <server>.database.windows.net -d <database> -U <user> -P <password> -q -c -t ","
bcp Person in SamplePersonData -S <server>.database.windows.net -d <database> -U <user> -P <password> -q -c -t ","
bcp Student in SampleStudentData -S <server>.database.windows.net -d <database> -U <user> -P <password> -q -c -t ","
bcp Credit in SampleCreditData -S <server>.database.windows.net -d <database> -U <user> -P <password> -q -c -t ","
You have now loaded sample data into the tables you created earlier. Execute the following queries to retrieve information from the database tables. See Write SQL queries to learn more about writing SQL queries. The first query joins all four tables to find the students taught by 'Dominick Pope' who have a grade higher than 75%. The second query joins all four tables and finds the courses in which 'Noe Coleman' has ever enrolled. 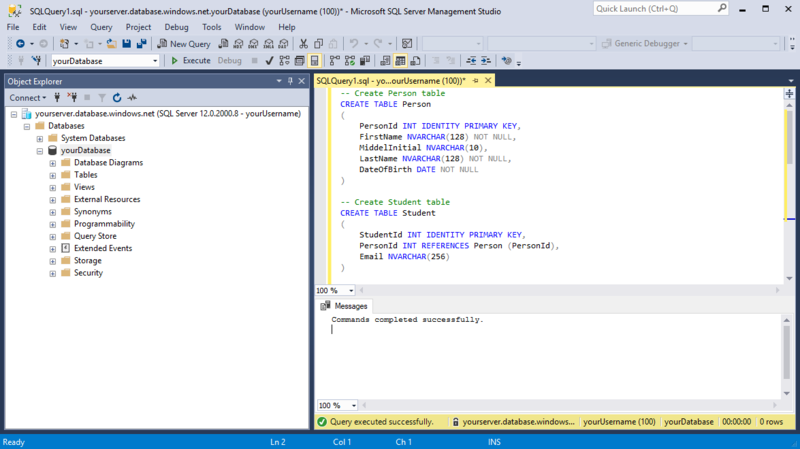 Advance to the next tutorial to learn about designing a database using Visual Studio and C#.